By Melissa Lennig on October 1, 2014 7 Comments. This content contains affiliate links. As an Amazon Associate I earn from qualifying purchases. Today I’m excited to be participating in a Halloween Read and Play Blog Hop with over 35 creative kid bloggers! Each of us will be featuring a Halloween themed children’s book and sharing a craft, recipe, or activity to extend the story. My youngest has always been excited by the spookier side of Halloween, so I chose a book with dark, mysterious illustrations and quintessential Halloween icons: spooks, bats, ghosts, pumpkins, and cats. 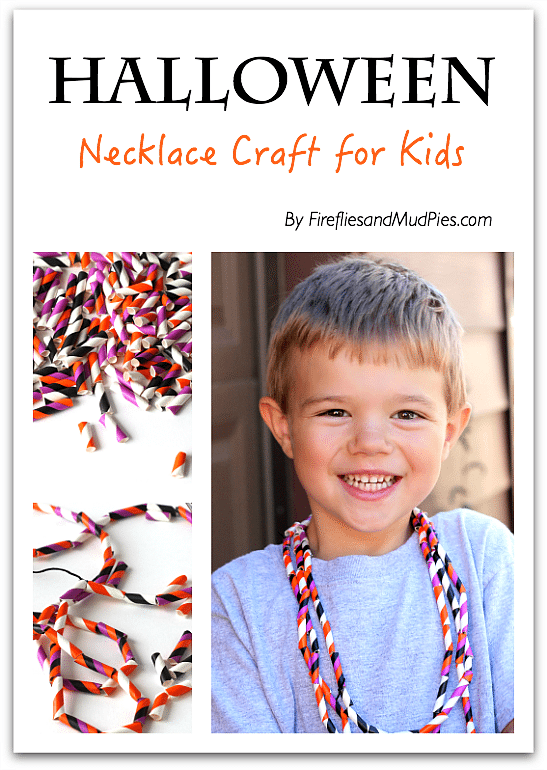 The book really hooked him into the Halloween spirit, so afterwards we crafted a vibrant Halloween Necklace to help practice those ever-important preschool fine-motor skills. For your convenience, this post contains affiliate links. Opinions are my own. We read the book Scary, Scary Halloween by Eve Bunting. The story had a surprise ending that we weren’t quite expecting! The illustrations by Jan Brett bring the story to life, but aren’t too frightening for younger kids. 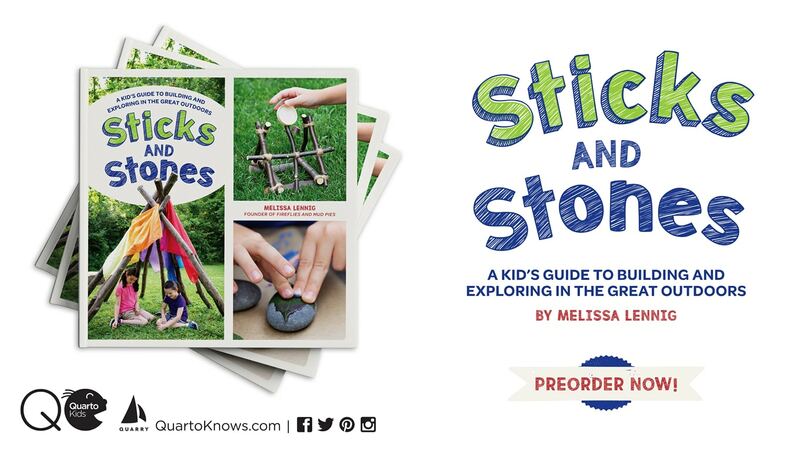 This is definitely a book you will want to add to your home children’s library! When the story was over, my little guy and I began prepping our craft. 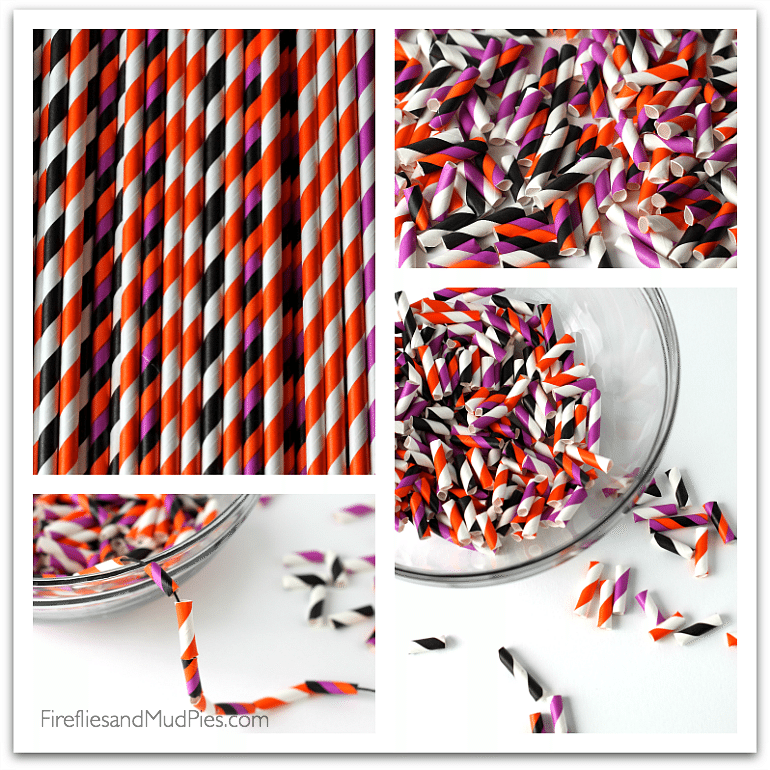 Together we turned 4 packs of striped Halloween straws into adorable, bright beads. When the beads were ready, my son created necklace after necklace! I enjoyed this craft because it is 100% recyclable if you use paper string, as we did. 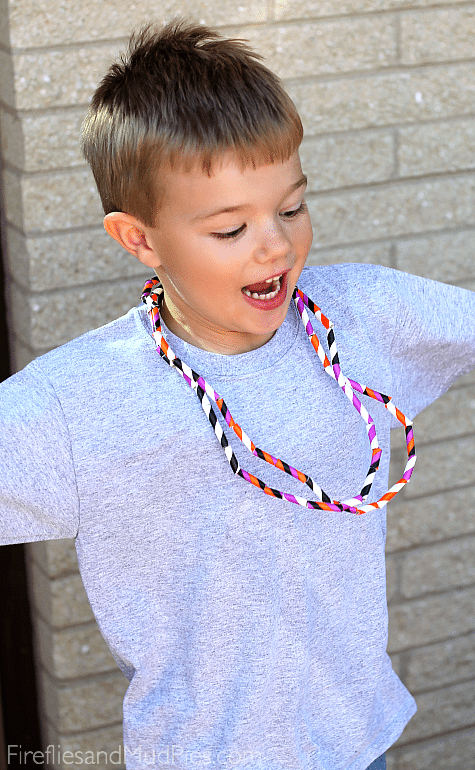 My son loved the bright colors, and also enjoyed the swishy, crunchy sound the necklaces made when he jumped! For more Halloween crafts, recipes, and activities, check out the links below. Big Pumpkin: Sequencing Activity — Fun-A-Day! There are so many incredible ideas for playing, creating, and celebrating Halloween. I invite you to join the conversation on the Fireflies and Mud Pies Facebook Page about your favorite Halloween books for kids!